More than 4,700 UCSC students are earning undergraduate and graduate degrees for work completed during the 2015-2016 academic year. 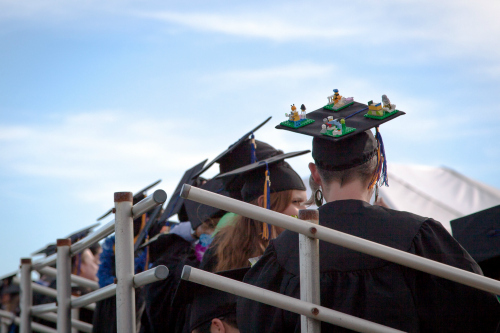 UC Santa Cruz commencement ceremonies are scheduled for Friday, Saturday, and Sunday, June 10-12, hosted by UCSC's 10 colleges, graduate division, and Baskin School of Engineering. Two dozen other celebrations organized by individual departments and resource centers will be held June 3 through June 12. A complete list of commencement events including times, locations, and speakers can be found at specialevents.ucsc.edu/commencement. Continuing a tradition from last year, nine colleges and the graduate division have invited alumni to participate as keynote speakers. New Yorker writer William Finnegan (Cowell, ’74, English literature) winner of the 2016 Pulitzer Prize for his memoir Barbarian Days: A Surfing Life, will speak to Cowell graduates Saturday afternoon. Journalist and author Claire Hoffman (Kresge,’99, anthropology) will speak at Kresge’s commencement, and James Datri, (Stevenson ’89, history), president and CEO of the American Advertising Federation, will speak at Stevenson’s. Jennifer Gonzalez (Ph.D., '96, history of consciousness) and professor of history of art/visual culture, will deliver the graduate division keynote. A total of 3,330 students have applied to participate in college commencement ceremonies. More than 4,700 UCSC students are earning undergraduate and graduate degrees for work completed during the 2015-2016 academic year. A total of 4,193 students are candidates for bachelor degrees for work completed in the arts, engineering, humanities, physical and biological sciences, and social sciences. Spring candidates for bachelor degrees total 2,733, according to the UC Santa Cruz registrar's office. Another 1,460 completed coursework and applied for their degree after the summer, fall, or winter quarters. Seventy-five students are scheduled to complete UCSC's education teaching credential and master's degree program in late summer, and a small number of students will receive graduate certificates in other fields. Alumni have frequently returned to campus as commencement speakers but the practice really took off last year for the 50th anniversary celebration. Other alumni related events are planned this year including an Alumni Welcome BBQ to celebrate the Class of 2016 on June 3 from 4-6 p.m. on the Lower East Field. The entire senior class and all local alumni are invited. Crown – Rob Forbes (Porter '74, aesthetic studies), founder of Design Within Reach and Public Bikes. College Eight – Eden Jequinto (Oakes, '04, American studies), Founder of the Guerilla Youth Theatre Project and a social activist. College Nine – Kevin Koenig (Crown, ’97, community studies), Ecuador program director for Amazon Watch. Merrill – Mike Rotkin (Ph.D. ’91, history of consciousness), former UC Santa Cruz lecturer and Santa Cruz mayor. Porter – Nikki Silva (Porter '73, aesthetic studies), radio producer and one half of the Peabody Award winning public radio team, the Kitchen Sisters. College Ten – Bettina Aptheker, UCSC distinguished professor of feminist studies. Baskin School of Engineering – Scott Dietzen, CEO, Pure Storage.